We know from space observations that charged particles, mostly electrons and protons, are continuously ejected from the upper atmosphere of the Sun, the corona, and blown into space, forming a solar wind reaching out to the farthest corners of the Solar System. The solar wind is a plasma, that is, a medium composed of charged particles moving under the laws of electromagnetism. It blows at speeds ranging from 400 to 800 km/s. Intermittently, bursts of high-speed solar wind are recorded, which corresponds to a higher level of solar activity. A typical solar activity cycle from low to high lasts 11 years, the last maximum of activity being in 2013. Predicting the Sun's wrath, the consequence on the immediate vicinity of planets and its effect on our technology-based environment is the purpose of Space Weather research. Space weather research makes use of remote and in-situ observations in combination with numerical simulations. The solar wind interacts with all solar system planetary objects, giving rise to many fluid and kinetic effects which are best simulated by numerical plasma models; these models include the physics and the chemistry at the origin of the formation of heavier ions in the vicinity of planets, of their acceleration and micro and macroscopic behaviour. These models solve the equations of motion of the planetary and solar-wind plasmas in an electromagnetic field. A synergy between numerical simulations including the necessary physics and observational datasets as complete as possible is the only way to make sense of the complexity of Space Physics phenomena. At the turn of the 20th century, Norwegian physicist Kristian Birkeland had the idea of building a space simulator to explain the mechanisms at the origin of the aurora: he showed that after immersing a magnetised sphere in an adequate vacuum, bombarding it with free electrons produced a glow which morphology and characteristics were not unlike the aurora he observed many times during his campaigns above the Arctic circle. Modern space physics was born. Fifty years later his predictions and concept of trapped charged particles in a magnetic field, originally met with skepticism, found themselves confirmed by the first satellite observations, such as that of Explorer 1 in 1958 (the scientific payload was built at the University of Iowa, under the direction of James van Allen, who later gave his name to the Earth's radiation belts). 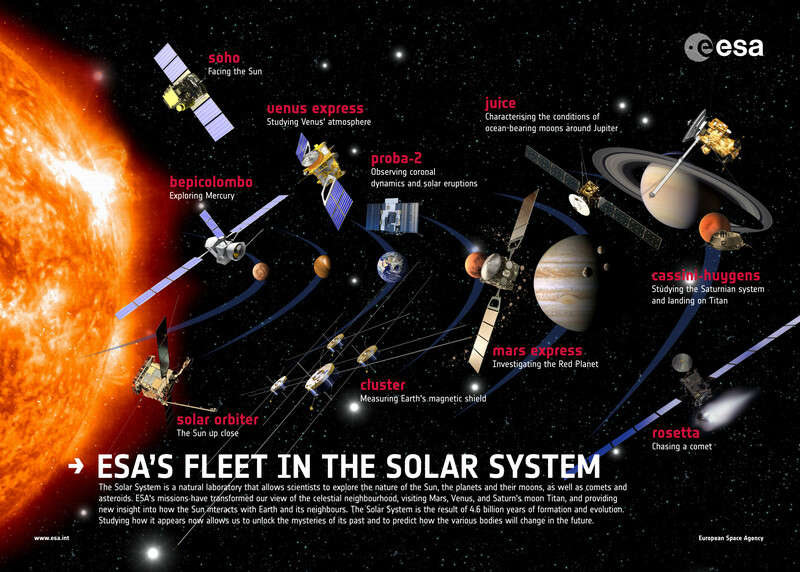 Since the advent of the space age, more than 50 scientific missions have been launched mostly by the American Space Agency (NASA) and by the European Space Agency (ESA) to study the magnetospheric environments of the Earth and other planetary objects, which is the basis of our current understanding of these systems. (colour code: ESA missions, NASA missions, Indian Space Agency) The asterisk sign (*) marks missions for which we have a co-Investigator status. For a comprehensive review of missions, either past, in flight or future ones, NASA is maintaining a search tool. When a planetary body with a thin atmosphere interacts with the solar wind, several phenomena take place: a magnetic barrier forms around the object due to the solar wind being "mass-loaded", while newly formed ions/dust molecules escape from the atmosphere/surface, participating to the atmospheric erosion (Kallio and Jarvinen, 2012). At the core of these phenomena lie plasma-neutral and, for airless objects (comets, Moon), dust dynamics, of which complementary aspects can be found in unmagnetised planetary bodies such as comets and Mars/Venus. Solar thermal and EUV radiation is responsible for the sublimation of ices and outgassing at the surface of comets and for the primary ionisation of the neutrals surrounding the objects. While for comets, photoionisation occurs at any cometocentric distance, it takes place for Mars above 100km altitude in a region called the thermosphere. The energy brought into the system can help particles escape the body's gravitational attraction and severely alter the dynamics of the plasma. In addition, for comets, small solid particles are ejected from the nucleus as dust grains of varying size, which in turn can produce neutral volatiles or even become electrically charged; they participate in this way to the plasma-neutral environment. The solar wind, composed of protons H+, electrons e- and α-particles He++ with a frozen-in magnetic field (also called Interplanetary Magnetic Field, IMF) shapes the magnetic barriers formed upstream of the planetary obstacle. Ionisation produces atomic and molecular ions of cometary/planetary origin. These charged species feel the Lorentz force F = q(E+v x B) associated with the motion of the solar wind. In turn, a convection electric field -v x B arises that accelerates ("picks up") the cometary/planetary ions, creating a plasma tail behind the object (coma tail or magnetosphere). The added mass to the solar wind slows down the flow and results in a compression of the IMF ("piling up" on the dayside, "draping" on the nightside). Plasma interactions in the solar wind and inside the magnetic boundary can be divided in several main categories: electron impact ionisation with the neutrals, charge-exchange between an ion and a neutral, and chemical reactions including electron recombination and various dissociative chemical processes.